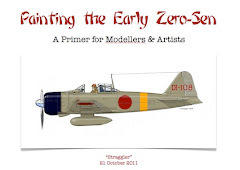 In comments to the first part of this ramble, Jim Lansdale raised some very valid points about why the colour of the Zero seems to hold such special interest and why the fidelity of the artifact colours attracts such debate. Well, it is an iconic aircraft, made equally famous in the West by the exploits of its pilots in the first year of war, personified by Saburo Sakai. It is a popular, even perennial, modelling subject, blessed by the appearance of remarkable models like the Tamiya 1/32nd scale kit and the ultimate Fine Molds 1/72nd limited edition. 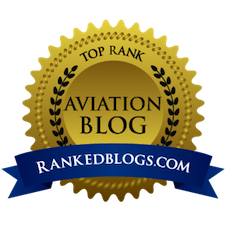 In a way the same mythology that attended its first encounters with Allied pilots has endured into current study of the aircraft. 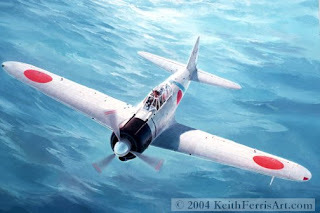 Also the widely held assumption, belief in and depiction of the pale whiteish grey colouring persisted for almost 50 years (and still does in some quarters - try googling "Zero fighter"), as typified by the Keith Ferris painting for the cover of the classic Bantam book 'Samurai' in 1978. Little wonder then that a relatively recent colour revision of such significance should attract disbelief, controversy, discussion and debate. And that situation is of course stimulated by so many unanswered questions and so many explanations for what we are seeing now. The most frequent FS 595b colour values cited for the current appearance of artifacts are 16350 and 34201. These are not exact equivalents because the colours have been measured to Munsell fractional notations (discussed elsewhere on this blog) but are convenient in conveying an impression of the colours. The FS values are more commonly accessible than the Munsell values and indeed the FS values are often quoted or depicted in articles and profiles as being the colours, to the extent that they have led directly to at least one hobby paint and are regularly displayed as the colour value by a leading profile artist. Although various descriptions have been attributed to these colours in the past the one that seems to represent the "consensus' now is olive grey. Convenient, because the closest RAL equivalent to both values is 7002 Olivegrau (Olive Grey) @ 1.50 and 2.95 respectively. The closest standard Munsell to both values is 5 Y 5/2 @ 3.67 and 0.13 respectively. These colours have also been variously attributed to the extant colour paint chips in the Imperial Japanese Navy colour standards document popularly known as 'Kariki 117' (Kaigunkôkûkiyô Toryô Shikibetsu Hyôjun, Kariki 117 Bessatsu - 'Paint Identification Standard for Naval Aircraft, Supplement to Provisional Regulation 117'). The problem with Kariki 117 is that no-one knows exactly what its status was, how it was meant to be used or, perhaps more importantly, why each defined colour series comprised several variations - some significantly different in appearance. Kariki 117 throws up immediate problems for the researcher in that the series colour descriptions of those colours that appear most closely to reflect the artifacts are not consistent with the contemporaneous evidence. The only know 'official' descriptions of the paint used are "grey rat colour" (in the maintenance manual) and "J3 grey slightly towards candy colour" (in the so-called Kugihô 0266 report*). The designer of the Zero, Jiro Hirokoshi, described the prototype as being painted a "dimly shining ash green" colour. 1. The Kariki 117 colour chips have been visually (subjectively) matched by at least two Japanese researchers to the equivalent JPMA (Japan Paint Manufacturers Association) chips which are aligned to Munsell notations. These matches have not been verified and there are inconsistencies in the values cited (which will be explored later). Without measuring the chips (which themselves may have deteriorated) using proper equipment no definitive consideration can be attached to a visual, subjective assessment or match. 2. In considering the Kariki 117 colours for Arawasi magazine Japanese researcher Ryôichi Watanabe made the following somewhat ambiguous comment about the 'I' series colours:- "I3 was used as a second coat on the Zero fighters and other aircraft, but there are several people who wrongly believe that I3 is ame-iro (a light brown or amber colour)". He also examples some anomalies in respect of specific 'D' and 'J' series colours and comments "Seeing these colours, grave doubts remain as the differences are so great, even taking into account colour shift and fading". 3. If the author of Kugihô 0266 knew enough about the Kariki 117 designations to refer to "J3" and the Zero paint was a standard colour why did he not simply describe the colour of the Zero as "Tsuchi iro"? We might legitimately ask how much the difference between 16350 and 34201 represents contemporaneous (batch type) variation and how much is the result of ageing or other unknown factors? If the latter then which one most closely represents the original paint? Incidentally, the reason for the two variations of 16350 and 34201 shown here accommodates the fact that the RGB values for these colours as displayed at www.colorserver.net are different to those in use elsewhere. The Colorserver version appears decidely more greenish. In both cases the DE2000 difference calculations to the brushed out and measured colour of XF-76 are included where a value of 2.0 or less may be considered a close match. 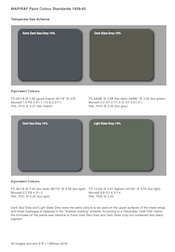 At Colorserver 16350 is described as a "gloss brown tinted grey" and 34201 as a "flat olive green". 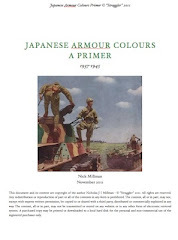 In fact the latter is adjacent on the gradiated page to 34088 which is often cited as an equivalent colour to the Japanese Army's olive drab (ohryoku nana go shoku - 'yellow green No.7 colour'). The hue is identical only the brightness (lightness/darkness) is different. As the olive drabs typically fade towards the lightness of 34201 it becomes difficult to determine which was the original colour. So, does the extant undersurface leading edge of a 1944 Kawasaki Ki-48 represent a similar olive grey to an early 1942 Zero or merely the faded olive green of an uppersurface colour "wrapped around" the leading edge of the wing or painted overall? More on this later. 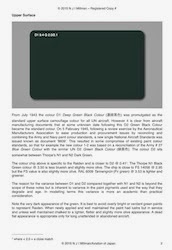 In the FS 595b coded system FS 16350 is considered to be predominately 'gray' (6) whilst FS 34201 is considered to be predominately 'green' (4). The last three digits form a code that provide a general indication of reflectivity. 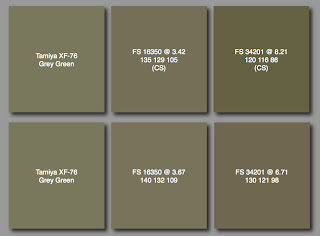 By a stretch and using the RAL example FS 34201 might be considered to be an 'olive grey' but it is not a pale colour. The validity of RGB displays is often the subject of criticism when it comes to the perception and understanding of colour. My late friend Bill Leyh never trusted visual matches commenting that he preferred "working in the digital world. Computers rarely have an agenda to pursue. And they're not color blind. It's all numbers to them - and all numbers are equal." However, the difference in RGB representation of the same FS values highlights the difficulties even of working in the digital medium. On the subject of colour fidelity, Bill wrote:- "I think it would be a serious mistake to take a 60 year old artifact and get anything close to a precise color analysis from it without a lot of destructive testing (buffing the paint down as deeply as possible - and that still won't do a thing to mitigate chemical decomposition of the paint). A RAMAN spectroscopic analysis might determine the exact elements present which might make it possible to determine what pigments were used, in what proportions, and recreate what the paint looked like (when new). The presence of chemical compounds not typical of paint pigments, but affecting the appearance of the artifacts, could be discarded so that the original appearance could be reproduced." Not so straightforward I'm afraid as additives may be original to the paint and not confined to pigments. Even knowing the pigments does not immediately convey the exact appearance as there are many degrees of purity to consider in respect of some pigment compositions - all of which can affect the appearance of the colour. More recently a respected Japanese researcher commented in respect of Kariki 117, in English:- "The color samples are left in the world now is too old. All color samples are discoloured. You don't believe that they are original colors. Colors we can see now. But they were painting about 60-70 years ago. The color is an old man. We must not forget it." * Kugihô 0266, Reishikikansen Meisai ni kan suru Kenkyû - Air Technical Report 0266, Research into Type Zero Carrier-based Fighter Camouflage'. Wow! this conversation is getting better and better! If one thinks about the Zero as probably one the most produced if not THE most produced a/c of the Japanese nation during WW2, a few things have to be taken into account. Just for Zero production how many thousands of gallons of exterior camouflage paint must have been produced? By how many different manufacturers? Certainly there can not be one color which in hue, value and chroma can be considered "The Color" even if a swatch of it was locked up in a safe somewhere. 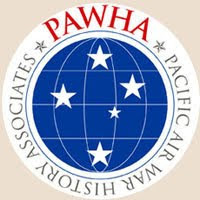 With all the different manufactures, forced substitutions of raw materials, differnt application techniques by differntly skilled workers there has to be a wide variation in the color family of the SAME color. Given an color range for a certain color say "J-3" there had to be differences as one moved along a color scale from left to right but they were all J-3 according to the paint manufactures. I bet not too many liters of paint were refused during wartime production for being the "wrong" color. Now 60+ years later given the enviormental, aging and the fact that the original materials and production methods are lost to time there are aspects to color questions that we may NEVER know.